Vaishnavas are just like Brahmins. But, they worship Lord Lakshmi Narayan instead of Lord Shiva. Vaishnava sampradaya means the traditional practice and lifestyle of those who follow the doctrine of Vaishnavism. Lord Vishnu is their God and they believe Him to be the superior Almighty of all Gods. Vaishnavism is based on the doctrine and school of thought which preaches that Lord Vishnu or Sriman Narayana is the Supreme Power and Saviour of this universe and you can attain moksha or peace and tranquility by worshipping and obtaining his grace. Sri Ramanujacharya is the Founder of this Vaishnavism. Dhanurmasam is a month considered to be very auspicious for worshipping God and possessing his grace and attaining moksha. Vaikunta Ekadasi falls in this auspicious month which is considered as a very great time for directly reaching God through winning his grace. This Dhanurmasam is called so because it is the month during which Sun is in the Dhanus Rasi. A rasi is known as an astrological sign. It is held in astrology that Sun passes through 12 rasis in one year. So, each rasi is equal to one month. There are 12 months and 12 rasis in one year. The month during which the Sun remains in the Dhanus rasi is known as Dhanurmasam. Normally, this Dhanurmasam falls during the period of 16th December to 14th January, every year. This period is very auspicious for Vaishnava sampradaya people. During dhanurmasam, Andal or Goda Devi, one of the 12 Vaishnava Alvars, worshiped God with true devotion and utter love and married Him on the culminating Bhogi festival day(the final day of dhanurmasam). Andal literally means one who ruled over God with her pure and innocent, untainted love towards Him. She wore the flower garlands to verify whether they are good-looking or not and then only offered to God. She worshiped God by composing 30 hymns on all 30 days praising His glory in her own Tamil Language. It is a kind of taking a spiritual bath herself in God's grace all those 30 days and winning His Love and heart through a marriage. So, this month is considered as very auspicious by all Vaishnavas for performing puja or the worship to attain Salvation from all worldly problems. You may view the full story of Andal Clicking this link. Dhanurmasam is to be performed on all the 30 days starting from the day Sun entering the Dhanus rasi and ending on the day prior to the sun entering the Makara rasi. The day Sun enters makar Rashi is celebrated as Makar Sankranti. One should get up early in the morning and after bathing, wear pious clothes and cook the Pongal for offering to God. Prior to that, the house and neighborhood need to be cleaned and a feeling of the religious atmosphere is to be created for experiencing a better spiritual feeling and divine happiness. You may decorate your house with flower garlands and mango leaves, etc. House entrance needs to be taken more care of. The door entrance wooden frame bottom portion (threshold or doorway) can be decorated by applying turmeric paste and spots of kumkum or rori. 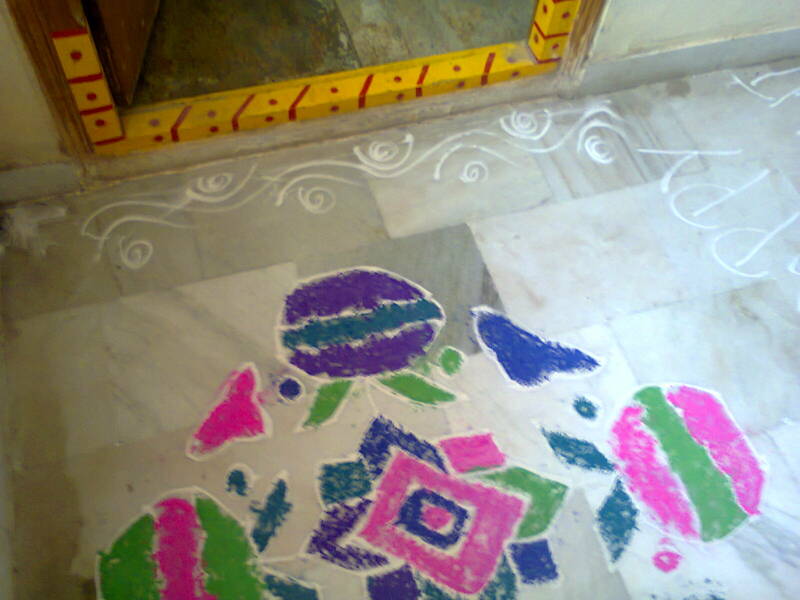 Rangoli is done in front of the door entrance to bring a beautiful look to your house entrance. 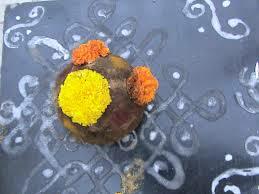 There is a tradition of placing Gobbillu in the rangoli throughout the month of dhanurmasam. It gives a religious and spiritual atmosphere to your house. Pongal is made up of rice and moong dal. For one cup of rice, you may add a quarter of moong dal or even less. Cook it in a cooker just like cooking your daily rice. After it gets cooked, you will have to top it with the black pepper and cumin that are fried in ghee. Then, you will place it before God. Worship God with your regular prayers. The sanctum sanctorum should be kept clean and auspicious. You may decorate both the seat of God and God himself with flower garlands and flowers. You may also worship with loose flowers while chanting hymns. Read the 30 hymns (or pasurams) composed by Andal known as Thiruppavai with devotion if you can afford lengthy time at worship. Generally, most devotees recite one pasuram or hymn each day (related to that day) and then offer agarbatti sticks' incense and then show the oil lights to God. So, on the first day, you will recite the first hymn, the second day the second one and like that. Thereafter, offer the Pongal to God. After doing this, you will light the Kapur or camphor and show it to God reciting the mangalasasanam. You will have to recite the 29th and 30th hymn while waving a hand fan to God with a towel or any artificial leaves to provide cool air while taking rest. Then, you will take the offerings of prasadam to eat yourself and to distribute to others. This is the way of doing it all the 30 days. On some special days during this month, some extra dishes are also prepared like Sweet Pongal, curd rice, tamarind rice, etc along with the normal daily Pongal. You will find the days mentioned in the Tiruppavai book mostly. Generally, the special auspicious days are considered to be day 1, 3, 9, 16, 24, 27, 28, 29 and 30.